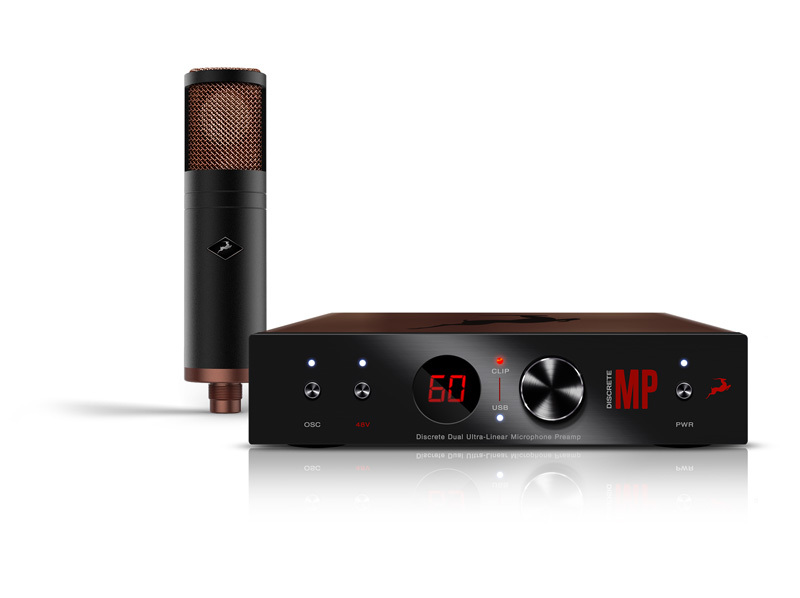 SANTA MONICA, CA, USA, JANUARY 29, 2018: high-end professional audio equipment manufacturer Antelope Audio is proud to announce that EDGE Strip — a breakthrough bundle comprising its DISCRETE MP Discrete Dual Ultra-Linear Microphone Preamp and already-available, trailblazing EDGE modelling microphone (for which the all-new, all-analogue dual-input microphone preamplifier itself is specifically designed) — made its debut at NAMM Show 2018. Antelope Audio’s talented team of engineering experts, led by capable company CEO Igor Levin, designed DISCRETE MP to perfectly match the frequency response of the already-available, trailblazing EDGE, a large-diaphragm modelling microphone featuring dual edge-terminated capsules for a smooth/natural sound, reproducing the expressiveness and character of costly classic microphones — albeit without excessive expense. Elsewhere, the EDGE Strip-bundled DISCRETE MP dual-input microphone preamplifier places the same transistor schematic that beats at the state-of-the-art heart of the aptly-named DISCRETE 8 Thunderbolt™ & USB Interface with 8 Discrete Mic Preamps and DISCRETE 4 Thunderbolt™ & USB Interface with 4 Discrete Mic Preamps series siblings — released to critical acclaim late last year — at its user’s fingertips. Furthermore, the EDGE Strip bundle comes complete with a package of microphone emulations, bringing field-tested microphone classics destined to make musical inroads into studio setups the world over. Developed in close collaboration with world-renowned experts, these must-have microphone emulations are available in native formats, facilitating lightning-fast workflow. Preamp emulations are also included in the package, together with the STAY-LEVIN compressor, personally designed by Igor Levin at Antelope Audio. Antelope Audio has always collectively prided itself in coming up with technologies that unite the digital and analogue audio worlds. While both DISCRETE MP and EDGE are all-analogue devices, making them fully compatible with any audio interface and A/D converter central to any studio setup anywhere, DISCRETE MP allows users to explore the full potential of EDGE in both Antelope Audio-centred setups or other audio systems. Saying that, thanks to its 1kHz hardware calibration OSC (oscillator), DISCRETE MP easily adapts to any studio setup. Still deeper, DISCRETE MP masterfully makes available Antelope Audio’s signature sonic footprint of pristine audio quality. The unique discrete design of its preamp allows Antelope Audio to modify each individual aspect of the preamp, putting total control over colouration, clarity and character in the hands of discerning users. and a mic preamp pushing out an accomplished gain range of 0dB to 61dB (in 1dB steps) alongside 48V phantom power. Put it this way: when taken together as the EDGE Strip breakthrough bundle, Antelope Audio’s all-new, all-analogue DISCRETE MP Discrete Dual Ultra-Linear Microphone Preamp and already-available EDGE modelling microphone make for a killer combination! EDGE Strip — a breakthrough bundle of Antelope Audio’s all-new, all-analogue DISCRETE MP Discrete Dual Ultra-Linear Microphone Preamp and already-available, trailblazing EDGE modelling microphone — is shipping in March 2018 with a projected price of €1,295.00 EUR.